Fire-dancing is an ancient ritual in which people dance barefoot on embers. It is typical for Bulgarians and Greeks. This custom has dated as far back as even before Christ as a pagan custom. The fire-dancer dances barefoot on the embers and while doing that he can predict the future. While dancing the dancers hold the icon of St. St. Constantine and Elena decorated with flowers. It’s remarkable how after the dance the dancers have no traces of any burns or wounds on their feet. When the flame of the bonfire falls to embers the coals are spread in a large circle. This circle has a layer thick about 10-12 cm. At exactly that moment one of the female fire-dancers changes her behaviour entirely – she grows pale with busy eyes so that everyone can notice her nervous shudder. The people call this peculiar condition “prihvashtane” (the “fit”). Hit by hallucinations the dancer starts to go round the circle of embers stepping under the rhythm of the drum. While doing that she continually pronounces the so called “vahkania” (which sounds like “ih-ih” or “vah-vah”) typical for fire-dancing. As the tension builds up someone hands over the icon to the dancer. The dancers, in a sort of trance, enter the circle of embers and start crossing it in different directions following the rhythm of the drum and pronouncing the “vahkania”. There are no sources giving us information about when fire-dancing originated in Bulgaria. We know that at the end of the last century fire-dancing has been spread all over the Strandzha Mountain and in some villages in eastern Trakia. In its deepest and most sacred essence fire-dancing or nestinarstvo means “purification through fire”. Fire-dancing is also a peculiar philosophy. First the dancers perform the act of “fit. The dancers grow pale. Their faces become expressionless. Their eyes are wandering with glassy stare. The dancers are so far from reality that they don’t feel the hot coals with their bear feet. There used to be whole villages whose inhabitants were initiated into fire-dancing. Where there were inhabitants not initiated into fire-dancing the ritual would be passed only in the families that were. This custom was observed very strictly. Another thing that we know about fire-dancers is that they never suffered from headaches or any other diseases. Another interesting information is that if a fire-dancer carries a sick child through the embers, the child recovers from the sickness. Another curious fact is that if a fire-dancer dances on embers with a watch, it stops working. If there is any kind of a metal object in the embers, it will burn the dancers’ feet, whereas the hot coals will not harm them at all. Former generations saw the dance performed on embers as a prayer for fruitfulness and rich harvest, a prayer well-tried in fire. They also saw it as a means to escape illness but mostly they saw fire-dancing as fiery purification of the human soul. There are four instrumental melodies that are traditionally played at the St. St. Constantine and Elena fair. The first three of those melodies are called “nestinar”, and the whole cycle is called “panagyrski”. The names of the melodies are closely related to the respective place and act in the ritual. Consequently the duration of performance varies. The Skopos (also called “on leaving”) – the melody that is played most often. It is performed on the way to the sacred places and on the way back and during the ritual visiting of the houses on St. Elena’s Day and St. Kostadin’s Day. The purpose of the music is to purify the road, the fairs of St. Ilia, The Mother of God, The Trinity and all the way to Vlahovo ayasmas (water springs near a sacred for the Christians place). “In The Fire” – the melody is performed while the dancers dance on the embers and sometimes during their dance in St. Kostadin Konak (resting place). When the moment for the fire-dancers' prophecy ensues, they give a sign to the musicians to stop playing. A few and more motifs, following a definite order, are repeated and improvised in all four melodies.There are connecting intonation links between the melodies, mostly within the framework of two or three time. The duration of each of the melodies corresponds to the particular act of the ritual. The performance can be interrupted at any moment. Slight tone variations in the bagpipe part can be observed in the different villages. Mostly they find expression in some tone changes, addition or skipping of a group of short tones, or ornamental figures; but seldom are there any fluctuations in the length of the motifs. The icons are the most important sacred objects in the fire-dancing ritual. They used to be called "saints" and "kumizmi/kunizmi", which indicates the special respect the fire-dancers have for them. They are not revered as mere idols but are treated as living human beings. All nestinar icons are "dressed" in red (red in the Balkan folklore is a symbol of the fire and its power, and also of the female beginning) "shirts" called "redbi", which are cases with an opening at the front, so that the image can be seen. The icons are decorated with silver chains with dangling small bells, coins and other ornaments. Nestinar kerchiefs are hung onto the "shirts". All nestinar icons have their "tail-ends" (handles pushed into the openings of the iconostasis), in order to be kept in an upright position, and "be seen" by the worshippers. The ability to be in contact with the patron saint, with other saints and with the ancestors during the state of trance and dream is the main characteristic of the fire-dancing. The act of dancing on embers being the ultimate expression of this ability is an inherent element of the ritual but it is not constant. This ability together with the predictions in the state of trance and dream are oriented at the fate of the village, of the town, of the country and of the very human being. The first step on the embers is usually preceded by an unfixed period of prophecies, dream visions, and physical sufferings. The pains are relieved with the dance on embers. According to an old legend St.Constantine visited an ill woman and told her: " If you dance in fire, you will be healed." At first she started making prophecies, and a year after that she was able to dance in the fire. The state of "obsession" is accompanied by pain and suffering. The "fit' is exhibited by darkening of the face, the fire-dancers usually give out shrill shrieks (which approximately sound like this: "ih-ih"/"vah-vah") and clap their hands. They seem half-dead while dancing on the embers. The rapid drop of the body temperature is a specific symptom of the “fit”. The fire –dancers become very pale, they grow cold and break out into cold sweat. The moment of "release" comes with the stabilization of their psychic and physical condition, and the rising of the body temperature. The "illness" gets over them during the days before St.St.Constantine and Elena's "panagyr" (fair). When "obsessed" they can dance without a fire. In Strandzha Mountain the celebration begins on the Sunday before St.St. Constantine and Elena's Day. Nowadays the ritual also includes visiting the saint patrons' holy springs ("ayasmas"), carrying of the icons of the two saints (St.St.Constantine and Helena), animal offering, and serving of ritual bread. The people who attend the ceremony ascend the plank bed, turn to East, cross themselves, light up a candle and stick it into one of the small metal crosses spread over the bed. Many people leave gifts - mostly woven kerchiefs, which they hang on the parapet of the plank-bed.Sometimes the fire-dancers "get" their "fits" there. On the Thursday before the 3rd and 4th of June, they celebrate the so-called "Little Constantine". In the early morning of that day the church keeper goes to the saint patron's chapel, and assisted by two or three other men, slaughters a lamb. The meat is usually boiled in the fireplace of the "konak". When it is cooked, the church keeper tolls the bell, and all the people of the village gather at the chapel. Then they start their walk to St.Constanine's holy spring, with the purpose to clean it. It is ater that that the church keeper opens the lid of St.Constanine’s spring, throws a coin for happiness and starts filling the vessels, brought by the people so that they can drink and wash themselves with the holy water, in order to be healthy in the days to come. Then each of them is served a helping of the boiled mutton which would give them health. The people are also served with ritual bread. There used to be a ritual night visiting of the whole village with the icons of the saints, which would take place on St. Elena’s Day (this practice hasn’t been conducted since the 1960s). The fire-dancers would visit every house carrying the icons with exception of the houses where someone has recently died or given birth. Each member of the family would go and kiss the icon, then the fire-dancers would shake the icons above the sleeping children’s heads. The function of this act is to bring health to the family and for obtaining the saints’ blessing. The fire-dancers carrying the icons were treated to some wine or rakia. During the visiting the icons would be put to rest several times. At nightfall people would build up a fire and the fire-dancers would dance on a circle of embers. On St.Constantine's Day begins with a new succession of ritual acts. The morning starts with the "dressing" of the nestinar icons (the so-called "tail-end kunizmi/kumizmi"). They are made by the main fire-dancer of the village. The ritual of “dressing” the icons is the following: the "icons' shirts" are censed by the chief priestess, and then they are handed to the church keeper who puts them on the icons. Once the icons "have been dressed", they are "ready to head for the holy spring" in a solemn procession. There they are "bathed" - their handles are cleaned with the holy water of the "ayasma". Fire-dancers often become "obsessed" on the way to the chapel and back to the village and at the spring as well. At noon the stacking of the nestinar fire begins. In line with some old records, fire-dancers do not start the dance until twelve carts of wood are burnt. When darkness descends upon the earth all the villagers gather, the musicians come - the bagpipe player and the drummer start playing a special melody. When the fire-dancers fall in the state of “obsession” they determine the exact moment for the procession to start. They walk in the following strict order: first is the church keeper, followed by three boys who carry the icons(it was very important that the icon bearers are unmarried), then, the fire-dancers, the musicians, and finally the rest of the people participating in the procession. After they arrive at the fire, they form a cordon, encircling the already- spread embers. The "nestinar obsession" reaches its peak. The so-called “skopos” melody played by the musicians also contributes to it. With whoops the fire-dancers get onto the embers. First they always trace a cross. After that they start walking on the embers at random. The nestinar way of walking on embers is particularly strange. They call it "treading" or "pleshtene". 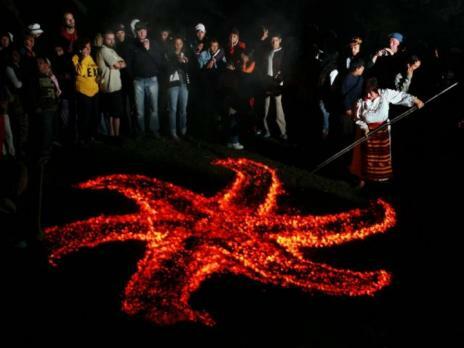 The ability to walk on embers without being burnt is the most impressive and important skill of the fire-dancers. Some medical specialists have observed that the skin of the fire-dancers' feet is very delicate and without any traces of callosities. Despite the different duration of the dances on embers (not less than 10 min. ), the fire-dancers' feet remain intact, without a slight trace of cauterization. It has been proved that the callosity is of no significance because very often some fire-dancers "bury" their feet ankle-deep in the embers. Another curious fact is that, during the dance the objects dropped by the fire-dancers (kerchiefs, the touch of clothes, etc.) do not burn. Some of the people who have witnessed the ritual conducted in the Bulgaria and Novo Pancharevo villages recall such cases. They say that there are cases when the fire-dancers would sit in the fire dressed in ordinary clothes and sometimes they would even lie in the fire. Many scientists are absolutely positive that at temperatures above 70°C human proteins denaturalize. The temperature of the embers is minimum 400°C. Specialists also consider that the fire-dancers' peculiar psychic state can explain the insensitivity to pain, but not the lack of burn damages. The fire-dancers themselves cannot explain their abilities, they consider them a gift. They are deeply convinced that their power comes from their unhesitant faith and trust in the saint patrons.